The Pittsburgh Steelers have placed rookie OLB Keion Adams on injured reserve, ending his season without him even seeing a preseason snap in year one. Adams was a seventh-round draft pick, and injured his shoulder early in camp He has not recovered enough to feature in the team’s plans this season. 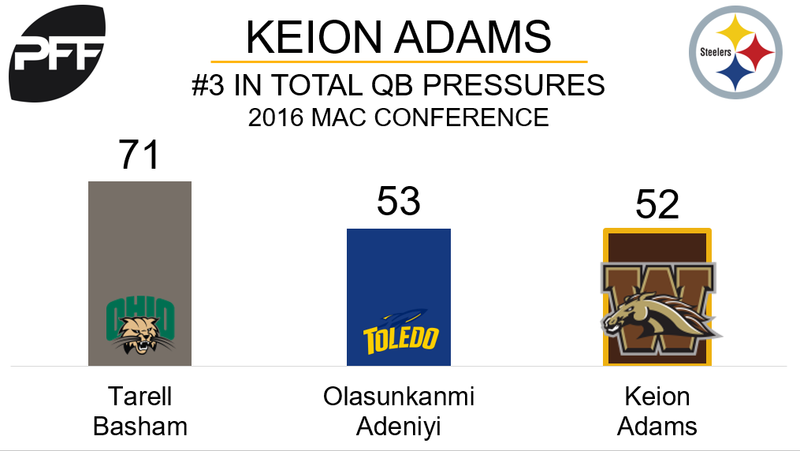 Last season, at Western Michigan, Adams notched seven sacks, nine hits, 38 hurries, and 35 defensive stops, and for the first five weeks of the season was on a complete tear, before suffering something of a mid-season slump and never quite recapturing that early form. His 54 total pressures last season ranked 18th in the draft class, sandwiched between first-rounders T.J. Watt and Myles Garrett.